One or more Customer Engagement apps solution files. Flat files or exported data files from the Configuration Migration tool. For information about the Configuration Migration tool, see Manage your configuration data. Custom code that can run during or after the package is deployed to Dynamics 365 for Customer Engagement. HTML content specific to the package that can display at the beginning and end of the package deployment process. This can be useful to provide a description of the solutions and files that are deployed in the package. After a package is created, you can deploy it either by running CRM Package Deployer or by using Windows PowerShell cmdlets for the tool. Before you import and run a package in a production organization, test the package on a non-production mirror image of the production organization. Always back up the production organization before you deploy a package. You can use the Package Deployer tool (packagedeployer.exe) to deploy packages in the following ways. The Package Deployer tool can only process one package at a time. However, it provides users with the ability to select a package to deploy from multiple packages available in the Package Deployer tool directory. Some of the screens and actions in the tool differ based on the package definition. You do not have to install the Package Deployer tool. Just download and run it. <PackageName> folder: This folder contains the solutions, import configuration, and the contents for your package. <PackageName>.dll: The assembly contains the code for your package. By default, the name of the assembly is the same as your Visual Studio project name. For detailed information about creating a package by using Visual Studio, see Create a package for the Package Deployer tool. For this topic, let us assume that the package folder and assembly from the Visual Studio project debug folder (<Project>\Bin\Debug) are copied to the c:\DeployPackage folder. Obtain the Package Deployer tool. The Package Deployer tool is available as a NuGet package. To use the Package Deployer, you must download and extract it to your local computer using nuget.exe. After you have extracted the Package Deployer tool, browse to the [ExtractedLocation]\tools folder to find the PackageDeployer.exe file. Copy the package folder and assembly from the c:\DeployPackage to the [ExtractedLocation]\tools folder. After the files are copied, run the tool by double-clicking the PackageDeployer.exe file in the [ExtractedLocation]\tools folder. Click Continue on the main screen of the tool. In the Connect to Microsoft Dynamics 365 for Customer Engagement screen, provide authentication details to connect to your Customer Engagement server where you want to deploy the package. If you have multiple organizations, and want to select the organization where you want to deploy the package, select the Always display list of available orgs check box. Click Login. If you have multiple organizations on your Customer Engagement server, select a Customer Engagement apps organization to connect to. Select the package to be deployed, and click Next. Follow the instructions on the subsequent screens to complete the deployment of your package. System administrators and customizers can pass parameters, such as a regional language code, to packagedeployer.exe from the command line. These parameters may only be configured by running Package Deployer tool at the command line. This feature was first introduced in Dynamics CRM Online 2016 Update 0.1. Available parameters are in this table. The following example instructs CRM Package Deployer to bypass some safety checks and sets the language to import as Polish. Use the pipe character | to separate parameters when you run packagedeployer.exe at the command line with multiple parameters. For more information about the parameters and values that can be passed to packagedeployer.exe, see Create packages for the CRM Package Deployer. The Package Deployer tool also provides Windows PowerShell support to deploy packages. Obtain the PowerShell files for the Package Deployer. The PowerShell files for the Package Deployer tool are available as a NuGet package. To use them, you must download and extract it to your local computer using nuget.exe. After you have extracted the PowerShell files for the Package Deployer tool, browse to the [ExtractedLocation]\tools folder to find the required files. Start Windows PowerShell on your computer with elevated privileges (run as administrator). Before you can use the cmdlet, ensure that you have copied your package to the PackageDeployer folder (in this case, [ExtractedLocation]\tools). A package is a collection of files and folders that is created in your Visual Studio project folder (<Project>\Bin\Debug) when you build your project in Visual Studio. Copy the entire contents of your project debug folder to the PackageDeployer folder. 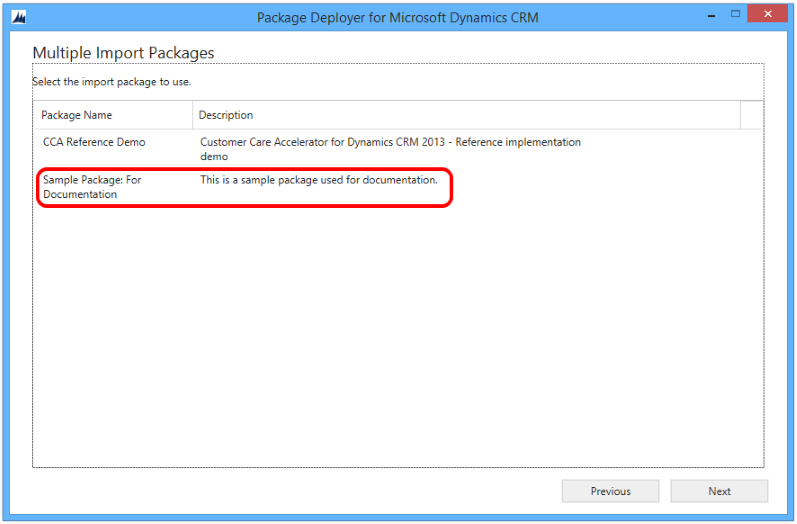 For detailed information about building a package using Visual Studio, see Create packages for the CRM Package Deployer. If you want information about a package in a folder, you can use the Get-CrmPackages cmdlet along with the –PackageName parameter to specify the name of the assembly in the folder that contains the package definition. The package assembly location can be stored in a variable by using the Get-CrmPackages cmdlet. Then it may be reused in the Import-CrmPackage cmdlet to specify a value for the PackageDirectory parameter. For example, you can store the information of one or more packages returned from the Get-CrmPackages cmdlet in a variable called $MyPackages. To display all the packages. To display only the third package. Then, you can reference each package in the array from 0 through n. For example, this cmdlet imports the first package found in $MyPackages. Provide your credentials to connect to your Dynamics 365 for Customer Engagement apps or Dynamics 365 for Customer Engagement apps (on-premises) instance. Running the following command will prompt you to type your user name and password to connect to the Customer Engagement instance, and we will store it in the $Cred variable, and use it later for connecting to your Dynamics 365 for Customer Engagement server. For the DeploymentRegion parameter, valid values are NorthAmerica, EMEA, APACSouthAmerica, Oceania, JPN, and NorthAmerica2. For the OnlineType parameter, valid values are Office365 and LiveID. Your supplied credentials are validated when you run the command in step 2. Next, use the Customer Engagement apps connection information stored in the $CRMConn variable to deploy packages to the Customer Engagement instance. The following command deploys a package, disassembles the package in the c:\UnpackedFiles folder, and records information to a log file in the c:\MyLogFiles folder. CrmConnection, PackageDirectory, and PackageName parameters are mandatory. For the PackageName parameter, you have to specify the name of the assembly that contains the package definition. The Verbose parameter is optional, and is used to display a detailed log of the activities performed during the package deployment process. The LCID=localeID parameter specifies the locale ID, such as 1033 for English-United States or 1036 for French-France, from the available locale IDs in the package. If not specified, the default language will be used. The SkipChecks=true/false parameter should only be used when the target environment does not contain any other solutions or customizations. When set to true, solution import will bypass some safety checks, which can improve import performance. The folder that you specify when you use the LogWriteDirectory parameter must already exist, and the user who is running the Import-CrmPackage cmdlet must have write permission to the folder. Additionally, the -Verbose parameter is required when you use the LogWriteDirectory parameter. The following example command imports a package named SampleCRMPackage and specifies English-United States (1033) as the language to import the package. To view the online help for the cmdlets, see Dynamics 365 for Customer Engagement apps PowerShell Reference. Login_ErrorLog.log: Provides information about the issues that occurred when you use the tool to sign in to the Customer Engagement instance. If there are any issues during sign in, a message appears on the tool’s login screen with a link to this log file. The message states that an error occurred while processing the login request and the user can view the error log. You can click the link in the message to view this log file. The log file is created the first time you encounter any sign-in issues in the tool. Thereafter, the log file is used to log information about a sign-in issue, whenever it occurs. PackageDeployer.log: Provides detailed information about each task performed in the tool during the deployment of the packages. You can view the log file from the tool by clicking the View Log File link at the bottom of the screen. ComplexImportDetail.log: Provides detailed information about the data imported in the last deployment by using the tool. Each time you deploy a package using this tool, the existing details from the log file are moved to a file called ComplexImportDetail._old.log in the same directory, and the ComplexImportDetail.log file displays information about the latest import done using the tool. Insist on a signed package assembly so that they can track an assembly back to its source. Test the package on a pre-production instance (preferably a mirror image of the Production instance) before running it on a production server. Back up the Production instance before deploying a package.